On Saturday 29th June a number of marches and events are planned around England, Wales and Scotland to call for “Dignity Not Destitution” for people seeking asylum as part of Refugee Week. March: at 1pm to Mary’s Church, Bramall Lane Sheffield S2 4QZ via The Moor. ñ We fled persecution, leaving our homes and families seeking peace and safety. But for many of us, our cases were disbelieved and our appeals for safety rejected by the Home Office. ñ We are kicked out of our accommodation and our food vouchers stopped. ñ We cannot receive benefits. ñ We cannot go home. We are stuck here like this for years. ñ We want to contribute, to be part of society and to pay taxes. We are teachers, electricians, artists, business men, doctors, farmers, students, parents, and friends. We are human. How can a human survive like this? Stop scapegoating us!. Our supporters have campaigned to get Sheffield City Council to say the government’s policy on forced destitution is wrong. We are pleased to say that in March they voted unanimously to support us, and condemn this policy. Now, we want to help build a strong national campaign. We want to raise awareness and join together to call for an end to these unjust and inhumane laws. This campaign might not make our own lives better but it will help those in the future who come seeking safety. Organised by SYMAAG South Yorkshire Migration and Asylum Action Group. Supported by City of Sanctuary, ASSIST and others. Locally asylum seekers and supporters are gathering in City Park Bradford (exact spot t.b.c) at 4pm: speakers, singing, banners, petition-signing. Stop Destitution! Give us the Right to Work! Housing is a Human Right! JUSTICE, FREEDOM & DIGNITY for ALL! Marching to Castle Park, with banners, masks and a giant scapegoat, stopping on the way to talk about education, health, signing at the police station, the right to work and where we go from here in our campaign. G4S and Serco executives are having to account for their abuse of asylum seekers (and the tax payer) for their disastrous provision of asylum housing as part of the COMPASS contract. They were summoned to appear before the House of Commons Select Committee on June 25th to “discuss their provision of the COMPASS contract, following criticisms made in both written and oral evidence to this inquiry.” The televised proceedings can be watched again here. We are pleased that the efforts of asylum tenants, charities and campaigners, particularly in Yorkshire, have built up enough momentum to cause G4S (and Serco) to be forced to account for their abuse of asylum tenants in the “asylum markets” (as Mr Small explained to SYMAAG). SYMAAG contributed a detailed dossier of evidence to the enquiry. We congratulate those MPs, like Jeremy Corbyn, who have taken a principled stand against G4S’ abuse for profit and applaud those charities who have called for this enquiry. And, most of all, we respect the efforts of asylum tenants who have spoken out despite real fears of victimisation from G4S and UKBA. We believe that whatever the result of the parliamentary enquiry into asylum housing G4S (and Serco and Clearel) should be taken off the COMPASS contract and forced to pay back the money they have taken from local authorities and tax payers. Our campaign against G4S running asylum housing began in February 2011 when a local man, seeking asylum from Zimbabwe explained “I don’t want a prison guard as my landlord”. He hasn’t changed his mind. After hearing a powerful and emotional account from a woman seeking asylum from Sri Lanka, three South Yorkshire bodies concerned with asylum seekers – ASSIST, Northern Refugee Centre (NRC), and the South Yorkshire Migration and Asylum Action Group (SYMAAG) – recently asked Nick Clegg, the Deputy Prime Minister and MP for Sheffield Hallam, to take up with his Cabinet colleagues the plight of persecuted Tamils in Sri Lanka. This persecution is reflected in the fact that in 2012 the UK received 1,747 asylum applications from Sri Lanka. The Home Office was slow to recognise the genuine crisis that was occurring and turned down many well based claims. As a result, in the first 3 months of 2013, there were no less than 99 successful appeals by Sri Lankans whose asylum applications had been turned down – an astonishing 44% success rate. In April 2013, “Arjuna” (not her real name) a Sri Lankan refugee of Muslim origin spoke to a SYMAAG meeting about the persecution that was taking place in her country of those of Tamil origin, whether, Hindu, Muslim or Christian. “They are limiting everything” she explained referring to attacks on Muslim Tamil culture and practice. One device was to remove people from the voting register, thus greatly reducing their rights of citizenship, including access to schools, rights to passports and so on. 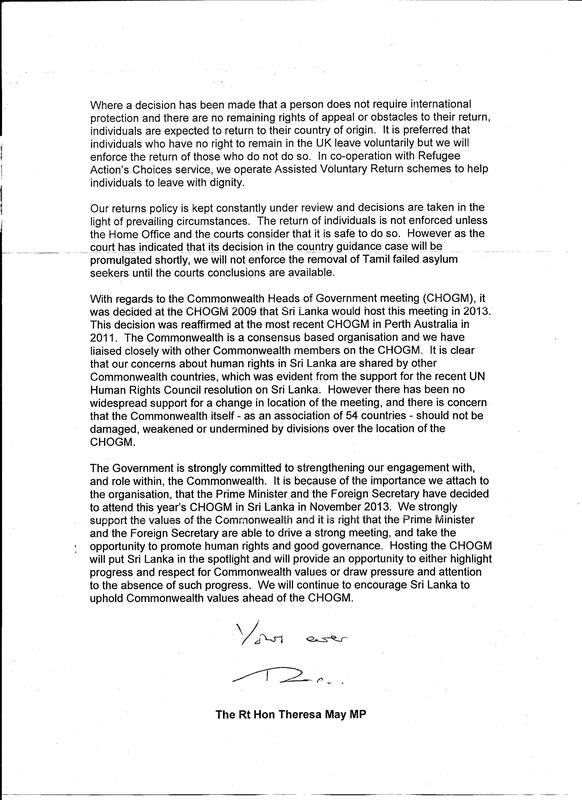 Both the UN High Commission on Refugees and the UK Foreign and Commonwealth Office have been highly critical of human rights abuses in Sri Lanka. Attempts to intimidate the judiciary and to impeach the Chief Justice have caused particular concern. Arjuna quoted the Sri Lankan President’s statement that “Minorities will be eliminated from our country”. • That the UK should seek Commonwealth agreement that the meeting of Commonwealth heads of government (CHOGM) in November should not take place in Sri Lanka. It was noted that such action had been called for by the Canadian Government and by distinguished international figures, such as Archbishop Desmond Tutu, and Mary Robinson ands by two former Foreign Secretaries, David Milliband and Malcolm Rifkind. In May, Nick Clegg passed on replies from both Theresa May, the Home Secretary, and William Hague, the Foreign Secretary. Theresa May’s reply argued that ‘the right approach is to consider the protection needs of individuals in particular circumstances’. She claimed that the Home Office’s decision in particular cases were based on accurate and up to date information. Where asylum applicants were turned down, ‘the return of individuals is not enforced unless the Home Office and the courts consider it is safe to do so.’ In the case of Tamils from Sri Lanka, enforced returns were suspended pending the outcome of a Country Guidance High court case. While the Government is evidently unwilling to go as far as we would have wished, it is clear that our pressure, along with pressure from others concerned with human rights in Sri Lanka, is having some impact. Is the Queen’s decision not to go to Sri Lanka in November solely due to her advanced age or was there also a concern to avoid lending royal dignity to the present Sri Lankan Government? It will be interesting to see how far Commonwealth leaders are prepared to go in criticising their hosts in November. 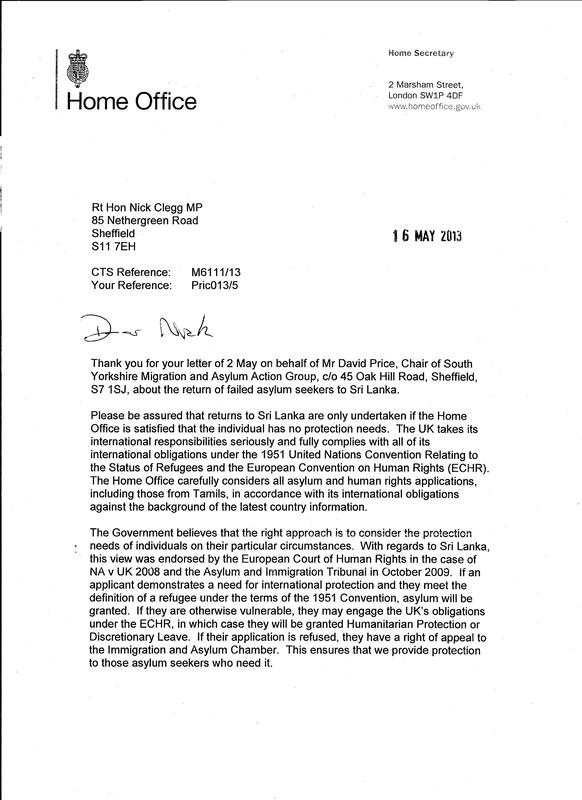 It will also be important to monitor developments affecting asylum seekers from Sri Lanka in this country, including the impending Court judgement and the Home Office reaction to it.